PVH Corp.-owned Calvin Klein Inc. announced two new multi-brand lifestyle store openings in Shanghai, China and Düsseldorf, Germany Thursday. 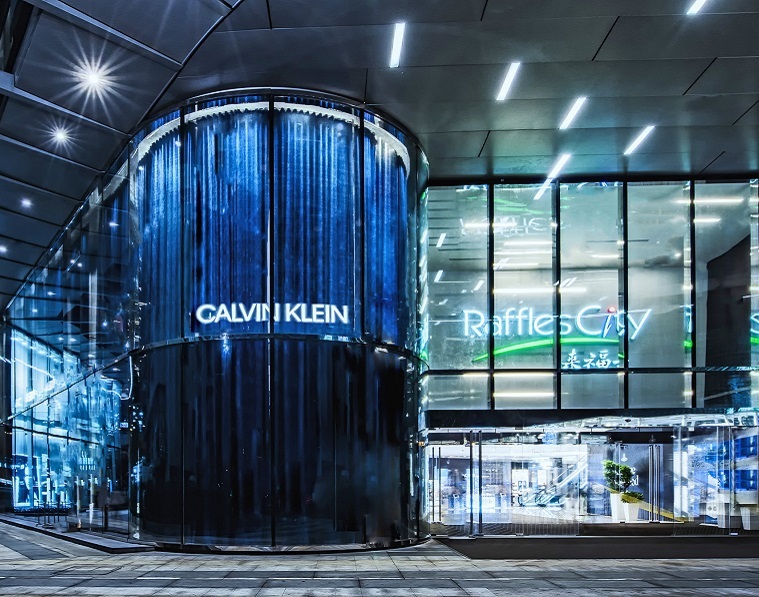 Both new locations are flagship stores, offering the latest in the brand’s retail design concepts, with the Shanghai store covering 6,000 square feet and two-stories in Raffles City, with men’s and women’s offerings of CK Kalvin Klein, Calvin Klein Jeans, underwear and performance collections. Meanwhile, the Düsseldorf location takes up three floors and over 3,500 square feet, dishing out men’s and women’s Calvin Klein jeans, underwear, swimwear and accessories. The stores feature a new design concept while relaying the brand’s minimal, modern aesthetic with added colors like cobalt blue curtains, pink geometric shaped rugs and cut-outs of models suspended from the ceiling. Meanwhile, CFDA recognized Calvin Klein Creative Director Raf Simons, silently makes his presence known through his Kvadrat fabric collaborative collection making an appearance in both stores’ decor. The brand also enhances the in-store experience through technology by offering shoppers the opportunity to engage with products and the brand through interactive video and denim fit guide walls.